LAU and DNA PLUS ME organize symposium to spearhead nutrigenomics in Lebanon and partner to pursue research in the field. The event drew students, faculty members and experts in the field. Eating is not just about satisfying hunger. Food contains a combination of nutrients, some of which may be healthy for our system while others may not. The growing field of nutrigenomics is investigating how each person’s response to nutrients differs according to genetic variations, thus raising awareness of the need for a personalized diet. Several cups of coffee per day, for example, are not necessarily harmful. But for some, the opposite might be true, in which case the recommended limit would be four cups. Similarly, a low sodium diet is not suitable for everyone as it might cause blood pressure to increase rather than drop. This can be understood by identifying genotypes that help predict whether a patient’s metabolism will be slow or quick in processing a given substance. Such information can be beneficial not only for weight loss, but also for preventing the onset of diseases such as diabetes, obesity and even cancer, experts say. Sitting next to El-Sohemy, was Daniel Wallerstorfer, who made a presentation on the Science of Genomics and DNA. Another International genomics expert, Wallerstorfer is the CEO of Novogenia Group, one of Europe’s market leaders in lifestyle and genetic diagnostics and a global pioneer in preventive genetic diagnostics. The group controls DNA PLUS, a Germany-based company specialized in genetic testing. LAU, in partnership with DNA PLUS ME, is leading this field of research in the region. 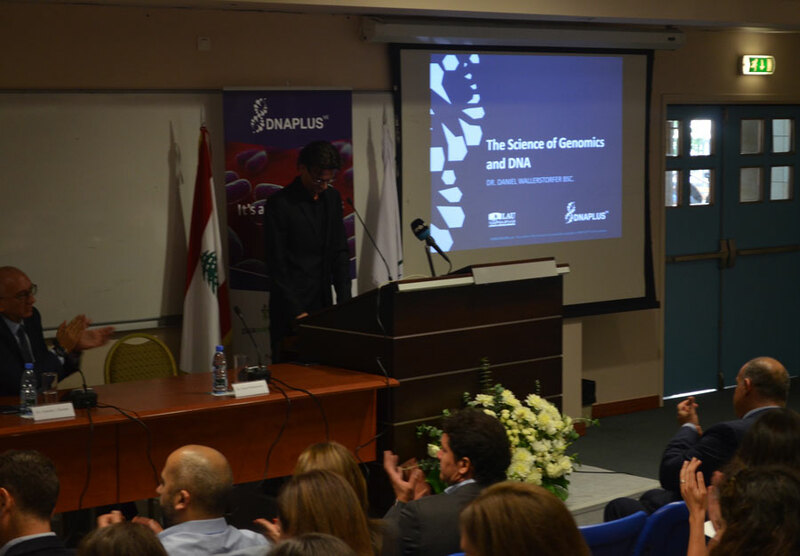 “It was only normal for us to join forces with LAU in the organization of its first symposium, where both entities worked on spreading the word to professionals and students across Lebanon,” says Nesrine Sfeir, corporate advisor of DNA PLUS ME. The company’s Middle Eastern branch is set to provide the region with high quality standards not only in genomic testing that addresses nutrition, sports and lifestyle but also in medical tests that will help community members determine their risks for diseases early on and prevent their onset. This material will be used by two LAU professors who will conduct research on the Lebanese population and identify what kinds of diseases it might be predisposed to.